This YouTube tutorial can also be found on THIS BLOG POST with additional links, tips and information to help you get started! Simply put... Scrapbook Max! 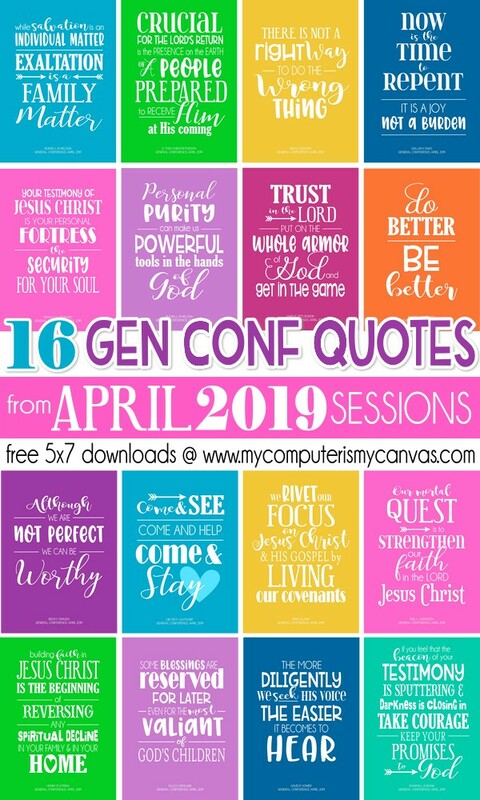 is an EASY to use digital/graphic design program. It's primary function is to create digital scrapbook pages... however, it has the flexibility to create all kinds of digital art! 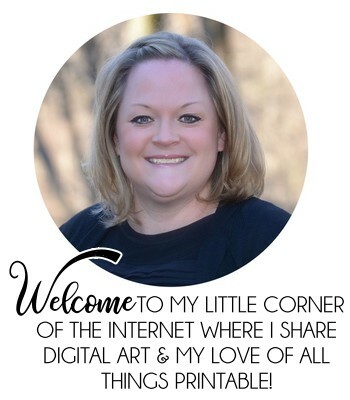 In fact, I use it EXCLUSIVELY for ALL of my digital projects... including all the printables, blog graphics and stickers you see on my blog and in my STORE! 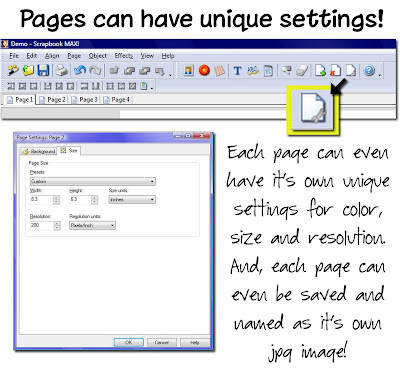 The above graphic is a snapshot of the main toolbar at the top of the screen when opening the Scrapbook Max! program. I LOVE that it's main functions are easy to figure out icons that put the most commonly used functions right at my fingertips. I also love how the program efficiently organizes pages (or images) within 1 simple project file. You can easily group like files together (within a larger project file). Think of it like this... Excel has "tabs" within a master spreadsheet file, right? Scrapbook Max! has "pages" within a particular project file that show like tabs at the top of the page... just like in Excel. 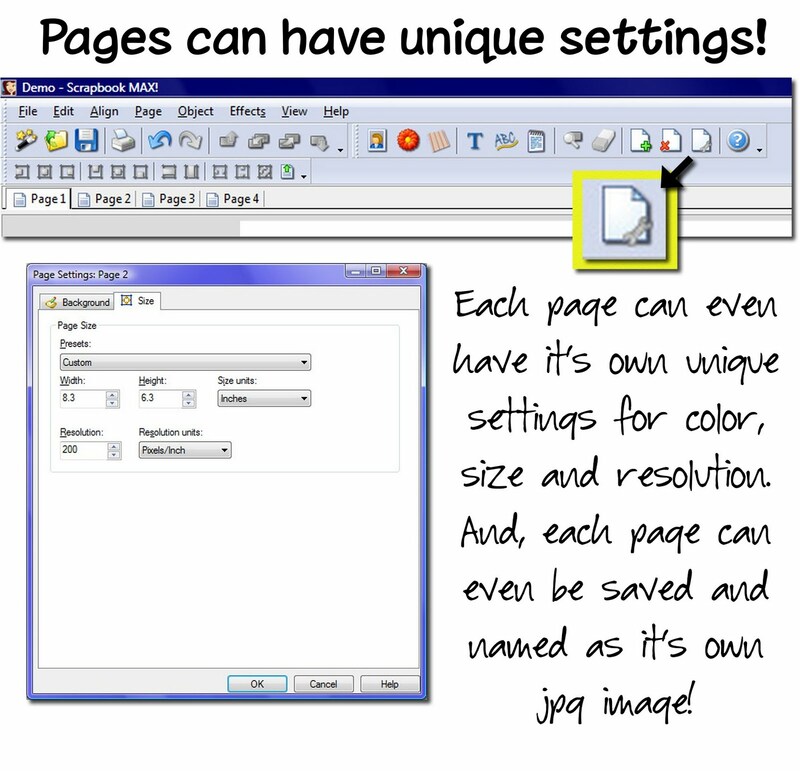 This feature is especially cool for grouping several scrapbook pages together into one simple file. However, this feature can be used in so many other ways! For example, when I create my blog designs... I keep my background image, my header image and all of my blog elements on separate pages, but within the same file. Scrapbook MAX! makes it easy for me to keep my files tidy, organized and all in one spot! Plus, it's super easy to navigate between pages which makes it easy to work on several images at once without wasting time opening, re-opening and closing several files. I love telling people about Scrapbook MAX! because it's so easy to use - and you don't have to be a graphic designer to create AMAZING projects! As you read through my posts, look at my projects and graphics... I hope you can see the endless creative possibilities Scrapbook MAX! can offer you. If all that doesn't get you excited... this might! You can download this program FREE for a 30 day trial to give it a test drive! 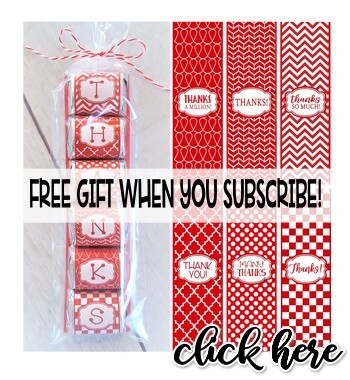 Don't miss new printables, freebies and discounts! 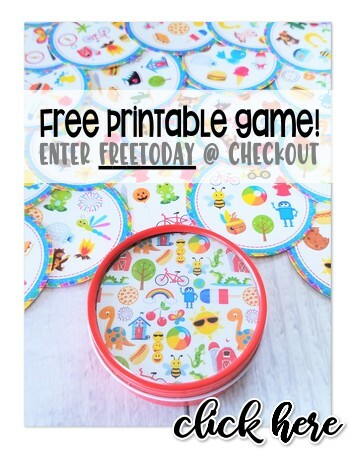 Click here to download a free 30 day trial of the popular Scrapbook MAX! digital scrapbooking software! M&M Nativity Legend, Recipe and Printable! How to Make BEADED Bottle Cap Key Chains!